I’m on a hill not far from Glasgow filming the last day of Trust Me for BBC1, a drama about a nurse, a working mum, who boldly steals the identity of a doctor and starts practicing in A and E. It’s freezing and windy and we have several big scenes to complete and there’s not enough time. There’s never enough time. (This is a recurring theme in my life now). I dip my hand in my pocket and find some dusty raisins and my heart swells. I think of my little one who has spent the last six weeks on the road in Scotland with her dad, visiting friends and family. I miss them desperately but having taken substantial time off work since her birth I have revelled in this break from being a full time mum. Nothing is as challenging and exhausting as looking after a young child so this job feels like a creative retreat. We are doing five day weeks and for those five days my head is almost entirely at work. The days are long and the schedule is demanding. I leave the house very early and don’t get back until way past bedtime so I miss out on family life completely. The evening is taken up preparing for the next day and responding to emails. Lunchtimes are usually hijacked by meetings and recces and so, finding even five minutes to call or facetime is tricky. As soon as wrap is called on Friday I speed back to my family. I crave being with them. My weekends are spent savouring every moment – catching up on every detail of the week I have missed, until Sunday afternoon when I have to tear myself away. One last story – The Elves and the Shoemaker – and then I’ll switch my attentions back to Trust Me and the next week of filming. My daughter sobs when the elves dance off in their new clothes, never to see Mr and Mrs Shoemaker again and my heart breaks with guilt. Am I the elves? Am I reading too much into it? I amend the story accordingly so that they do a lap of the village, have a tea party then come home refreshed with new stories to tell of their adventures. I’m not sure she is convinced. When I was pregnant I felt that I had to keep my bump hidden for as long as possible. Somehow I thought that having a baby would mean I would no longer be considered for any jobs. I often wonder if there is a bias against hiring a woman if she is a mum. Is there an unconscious warning bell on the part of the decision maker? In one of my first meetings back, a producer (a woman) looked at my CV and suggested the last couple of years showed a ‘reluctance to work’. I was stunned. Is this really how maternity leave is perceived? Before my daughter was born I thought it would be easy to wrap her up in a sling and bring her with me on whatever job I was doing. Surely she would just sit quietly in a corner and read a book or draw and be the perfect angelic child. When she was tiny I had a sound mix to complete on a job. The producer was completely open about me bringing her along – ‘People bring their dogs to work all the time, why not bring a baby?’ I loved her attitude. It was do-able and I managed to keep my newborn happy most of the day but it was utterly stressful and I learnt early on that my working environment and babies don’t mix. Juggling the two and feeling like you haven’t neglected either is what I now know to be the holy grail. I feel fortunate that my first long job back, on Trust Me, was with a company who understood the demands of being a working mum and were very accommodating in offering flexibility where it was possible to do so. In prep I was able to manage my day in a way that allowed me to spend time with my daughter and having a local edit house meant I could do breakfast and still get home for bath and bedtime. And while the shoot is full on, it doesn’t last forever. 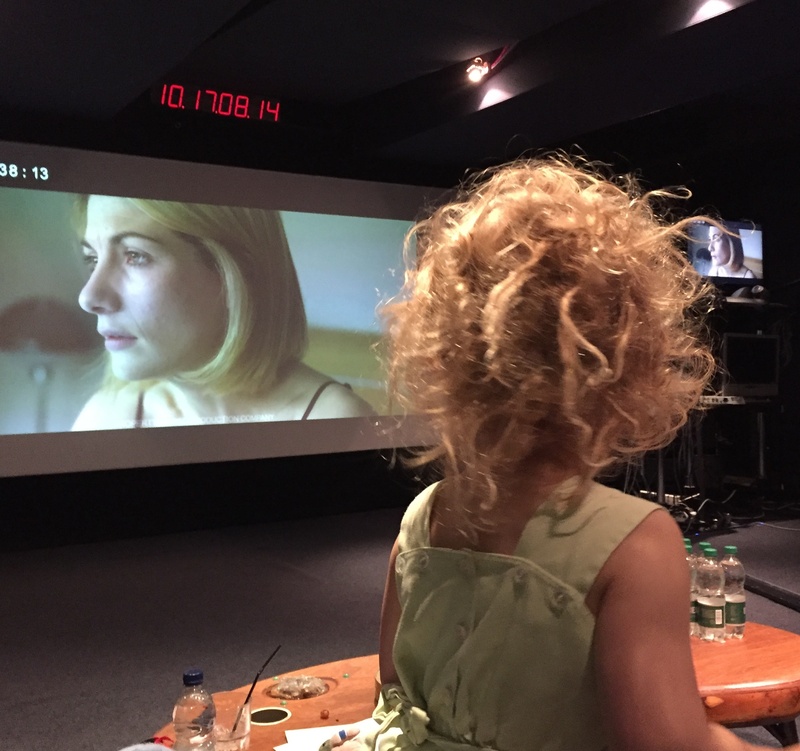 By the end of Trust Me my daughter was curious about what I did at work so I dared to bring her to an ADR session… for half an hour. That was all I could cope with and just about long enough for her to polish off the fruit bowl then find it all a bit boring. I hope one day she will be inspired by having a working mum and know that she can do or be anything she wants to be. It’s hard making it all work. The nature of the industry is transitory and unpredictable. Meetings are requested, shifted and cancelled often at the last minute and there is often a mad scramble for childcare. 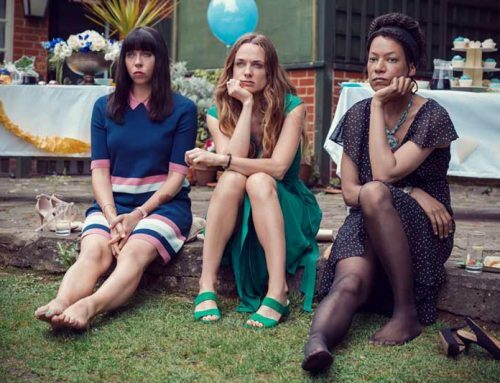 I’ve had my fair share of meetings where a Granny, Auntie or friend is planted in a cafe nearby entertaining my daughter, unbeknown to the producer I am pitching to. Having a support network is vital and building a community is part of this. My partner is also freelance so we take it in turns to work. This is how it works for us. I am constantly inspired and encouraged by all the women around me who are making it possible and this is why Raising Films is such an important organisation.